Mumbai Region Rainfall as on Sunday morning 8.30 am: Nana Chowk 56 mms, Grant Road 53 mms, Byculla 50 mms, Worli 42 mms, Vagaries 41 mms, Colaba (IMD) 37.4 mms, Bandra 20 mms. Dadar 10 mms, Scruz (IMD) 5.5 mms, Goregaon 3 mms, Chembur 2 mms, Deonar 2 mms, Bhandup, Kandivali, Mulund and Malad 1 mm. So, concentration was mainly in the South Mumbai region from Colaba to Worli. North, NW and Eastern parts had almost negligible rains. No major change in forecast for Sunday (than what is put up below): Warm day, at 32/33c. Thunder showers drifting in some parts by evening. SWM withdraws from Rajasthan, Part of Kashmir, Part of Kutch, Punjab and Haryana as per Vagaries..13th September. And with it the post moonsoon heat !. Bikaner was hottest today in India at 41.7c, Jaisalmer at 40.6c and Bhuj 38.3c. And across the border, Nawabshah was hottest at 41.5c. But, Northern Pakistan, now being sweeped by an upper air WD, is getting good rains. Lahore 50 mms, Muree 45 mms, Rawalpindi 43 mms. The WD is expected to move East and enter extreme Northern India hills. By the way, the Northern hills are having above normal night temperatures, and lows like 16c in Srinagar, 8c in Leh and Gulmarg are too high for this time. Even in the HP mountains, Kalpa at 10c and Keylong at 9c are higher than expected. With the coming WD, nights will get cooler in the mountains. Western Nepal will benefit from this WD. Otherwise, Kathmandu may still see a warm day at 31c, and partly cloudy skies. Another few more days for the SWM to withdraw and bring cooler nights (currently at 19c). The axis runs thru central India, and the Eastern coast trough remains moderate. Weekend, Saturday and Sunday, will see Thunder showers in Madhya Maharashtra, Inner Konkan, Marathwada, Interior TN and interior Karnataka. 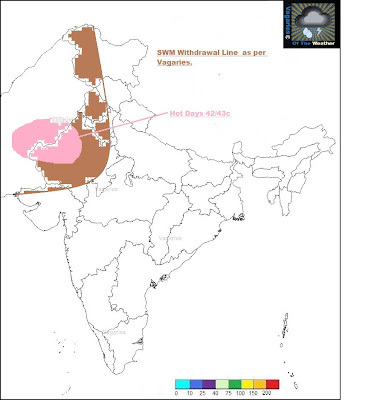 Regions of Heavy Rainfall: Southern Madhya Maharashtra, that is Solpur region and adjoining N.I. Karnataka. Mumbai: Warm humid day, at 32/33c being partly cloudy. There may ( if at all) be only localised thunder showers in some parts of city drifting from the East. It will be a "hit and miss" chance for some part of city. The rainfall will not exceed 10 mms. Outer townships: These regions will also get the "hit/miss" thunder showers. Not all the regional townships will get the showers. Rainfall in the affected towns will be around 35 mms/day. A low pressure is likely to form off the west coast next week. Chennai: Saturday will be partly cloudy with showers in parts of the city. Average rainfall not exceeding 10-12 mms. Sunday, a thunder shower or two in some pockets of the city. Rains around 7-10 mms on Sunday. Pune: warm day, thundery developments by afternoon. But rainfall restricted to 15-20 mms/day. This week, from Monday to Friday, Pune got good rains. The rain amounts for the week gone by were:( Monday thru Friday) 20.2, 56.5, 9.8, 0.3, 15 mms = 97.8 mms ( For this week, Vagaries had estimated about 75 mms). Delhi NCR: Partly cloudy on Saturday. SWM moves out by Sunday, and days warming up to 37c. Kolkata: One or two thunder showers. Frequencyof current thunder showers continue in the weekend. Would mumbai be able to touch 100 inch rains by end of monsoons. As Rajesh sir's analysis shows, Bangalore particularly (and SI Karnataka, Interior TN, Rayalseema in general) has had a phenomenal September (and even SWM) so far. Where is sset now with his desertification theory? Humidity is very high today , hope we get a decent thunderstorm by evening. In Goa, by 2 pm dark thunder clouds form in the east in the interior and the west is clear with blue skies. Over the next hour or so as the thunder clouds roll on towards the sea it's a 'hit and miss' for many parts of Goa since last two days. Rajeshbhai - Do these rains count as SWM rains and accounted by IMD as seasonal rains? Just curious! @ Atul. Same is the case with Mumbai too.. Eastern some outer townships get Thunderstorm and near coastal townships/Mumbai gets light rain or miss. As it is an easterly rain so mostly localized TS seen so hit & miss seen all over Konkan & Goa.. And as per IMD, all rain from 1 June to 30 Sept is counted as seasonal SWM Rain..
Past few days Vasai experiences thunders but hardly any rain falls.this years farewell thunderstorms are really dissapointing. Today I am experiencing first time in life that Thunderstorm is striking lightning from 4.30pm till now(8.45pm) !! So more than 4 hours have passed but lightning are continuing to struck in intervals in Badlapur !! But rainfall is less here till now..
Navi Mumbai since last 6 days lightening, thunders and torrential rains. Seems in few showers massive amounts fall (50-80mm of rain). IS A LOW PRESSURE DEVELOPING IN BAY OF BENGAL ???? Look's like There is a chamce of another 'low' to develop in 'bay of bengal' and enter from orrisa , but will it enter maharashtra hence delaying the withdrawal of SW monsoon from maharasghtra? Super torrential rain lashed Badlapur with huge lightning & thundering for 2hrs. For 40 mins rain rate was so high that it was feeling like 26 July 2005 rain !! Why has storm movement NNW again ?? It was from E all these days in Maharashtra. btw, what stations are there between Colaba and Santacruz?? I think they've been battered badly. past two days very light thunder but today evening in thane and eastern township of mumbai got heavy thunderstorm with huge lightning and cloud bursting..its natural withdrawal phenomenon or its effect of low forming in arabian sea..ur view rajesh bhai. The wind is from west direction today..here..in malad and very heavy rain with thunder..n lighning..
its huge thunder with lightning. i can see many places in deonar under water...Still raining heavily...Roads are also waterlogged..
navi Mumbai torrential downpours- except for thunders- looks like june-july rain!! Guess by end of monsoon Mumbai will cross 2500mm. Wondering inspite of trough over coastal KAR/KERALA high intense rains is over konkan, usually by evening/late afternoon satellite shows dense cloud coverage over MAHA (since past 1 week). Now coverage is seen regularly over central India. Heavy Rain lashing Badlapur from last 30mins. Badlapur Railway Station flooded for first time in this monsoon due to torrential rain in short period ! !